Well, it was a combination of courage and a bit of craziness! 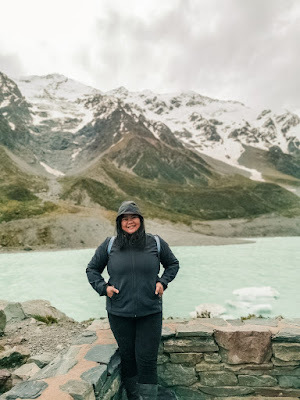 But the practical side is that I was able to get a visa which allowed me to legally stay in New Zealand for a year and work at the same time as well. 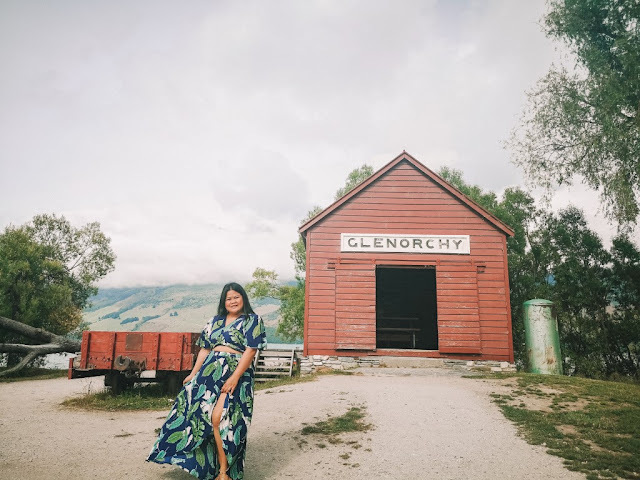 As I’m getting questions regarding the application process, I decided to pen this post to share with you how I moved to New Zealand through the Working Holiday Visa (WHV) Scheme for Filipinos. I. What exactly is this visa? II. Is this visa a way to permanently stay in New Zealand? IV. What are the steps in getting a WHV? V. What are the visa conditions and how to use this visa? Let’s get it out of the way: I am in no way connected to Immigration New Zealand nor am I a licensed immigration adviser. I have no purpose to replace them because I am not an expert by any means. 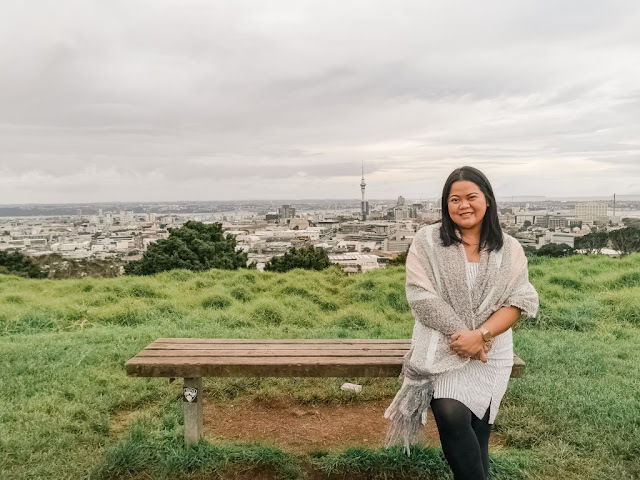 Through this post, I wanted to share my own experience and opinion regarding the New Zealand Working Holiday Visa Scheme for Filipinos. As you read, please take everything with a grain of salt and always cross-check with Immigration New Zealand to ensure that all information you have is factual and current. Lastly, bear in mind that my experience may also be different from what you will go through or from those of other previous or current working holiday visa holders. 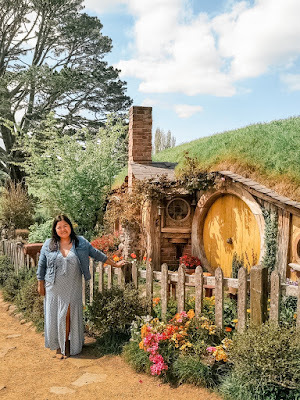 The New Zealand government assumes that you will be in the country primarily for holiday or leisure and they have been generous enough to allow visa holders to take on work as a way to supplement their funds while going around Middle Earth. Yay to this as you don’t have to worry about being broke in Kiwiland! The New Zealand Working Holiday Visa Scheme for Filipinos started in 2014. For most first-world countries, there are unlimited (no quota) working holiday slots or places and they can apply at any time of the year. However, for us Philippine passport holders, there is an unforgiving quota of only 100 slots per year and we can only lodge our application online on a specific date and time. Because of this, the competition in getting a slot is extremely tough! You will go head to head with hundreds, even thousands, of hopeful Filipinos to get 1 of the 100 coveted slots! II. IS THIS VISA A WAY TO STAY PERMANENTLY OR BE A RESIDENT IN NEW ZEALAND? Depending on your purpose, goals, sheer luck, and determination, it can be. 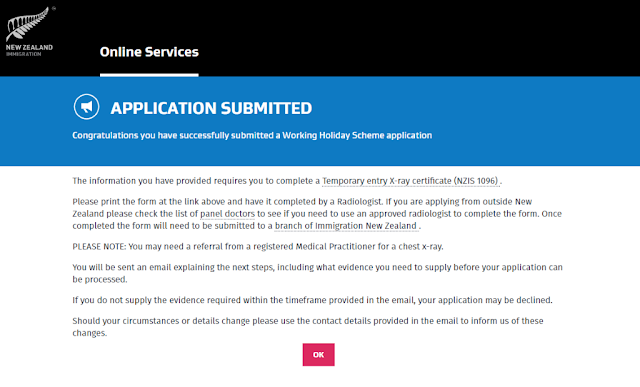 While this is classified as a temporary work visa, some holders I know use this as a stepping stone to find a permanent job and legally stay in New Zealand indefinitely. Work rights are restricted on a working holiday visa—among others, you are only allowed to work for a maximum of three months for the same employer. It IS illegal to take on a permanent role while on a working holiday visa but it’s NOT illegal to try and find one. Once you are offered a permanent job, you just need to apply for or convert to another work visa—a pathway which most people take. III. HOW MUCH DOES THE VISA COST? 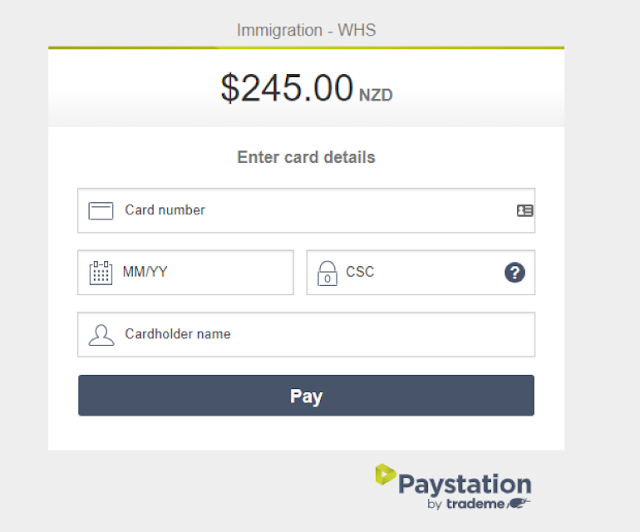 As of January 2019, the immigration levy fee is NZD 245 or roughly around Php8, 740. Other than the application fee, you also need to take into consideration the fees that you will accumulate in gathering your documents, the chest x-ray examination cost, your language test fee (if submitting one), cost of a return ticket, and your "show money" of at least NZD 4, 200 (around Php150,000). IV. 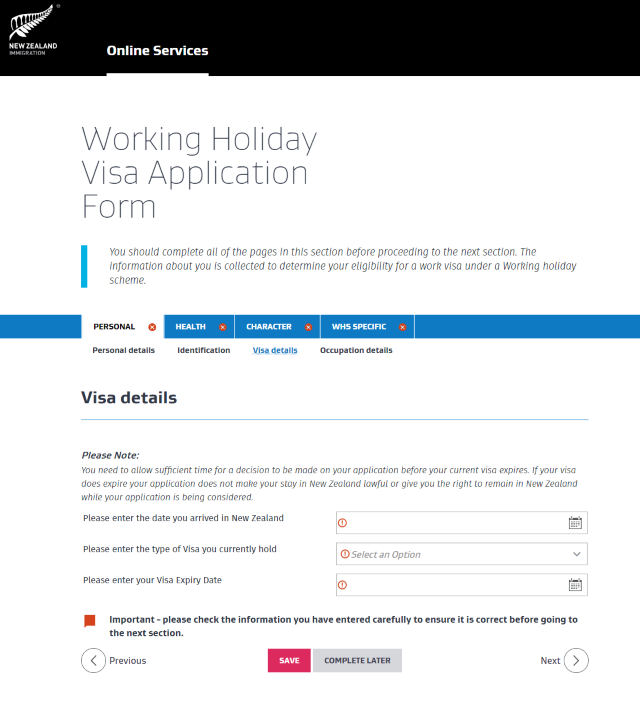 WHAT ARE THE STEPS IN GETTING A WORKING HOLIDAY VISA? 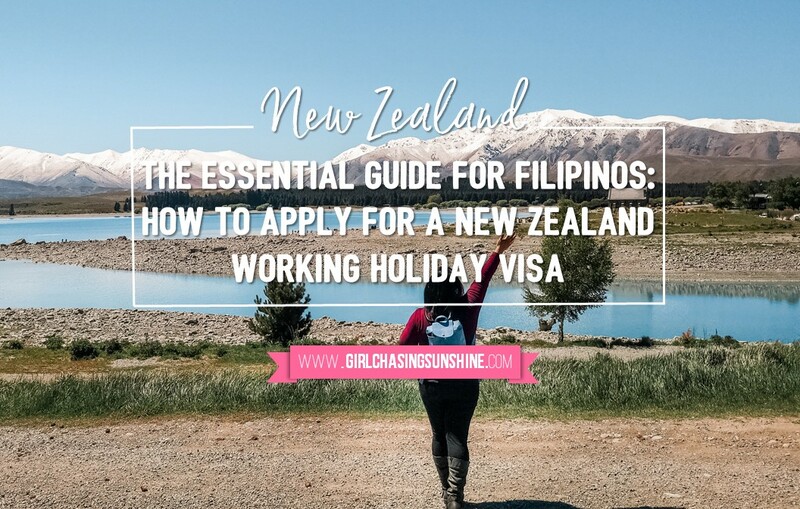 Here goes the important part: the process in obtaining a New Zealand Working Holiday Visa for Filipinos. If you are one of those who are keen to go to New Zealand on this visa, you may use the general guide below as reference. 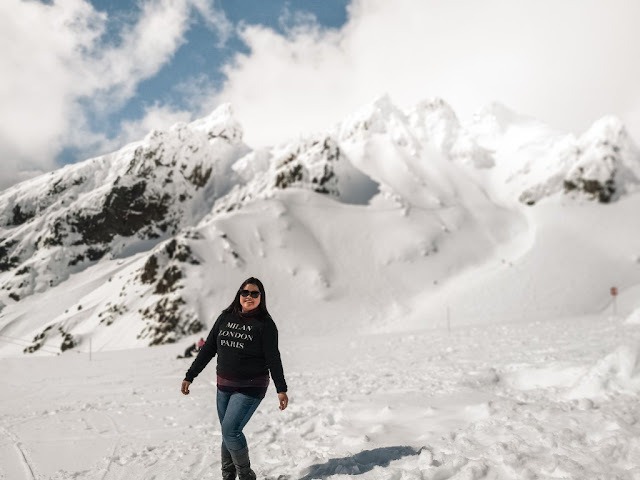 You must have a Philippines passport that is valid for at least 15 months after you first arrive in New Zealand or three months after your planned departure from New Zealand. So if your passport is expiring this year or early next year, you are not qualified. Best to have it renewed any time before the application date. You must meet New Zealand’s health and character requirements. Based on your answers in the application form, a chest x-ray certificate will most likely be required. If you are qualified based on these criteria, it’s now time to do the second step. It’s highly advisable to create an INZ Online Services account prior to the application date. This won’t take more than five minutes and just like any other online registration, it will ask for your name, email address, preferred username, and password. Click here to begin registration. After this is the most crucial and nerve-wracking part of the application process. Applications to the New Zealand Working Holiday Visa Scheme for Filipinos can only be submitted online using the electronic form provided on the Immigration New Zealand (INZ) website. 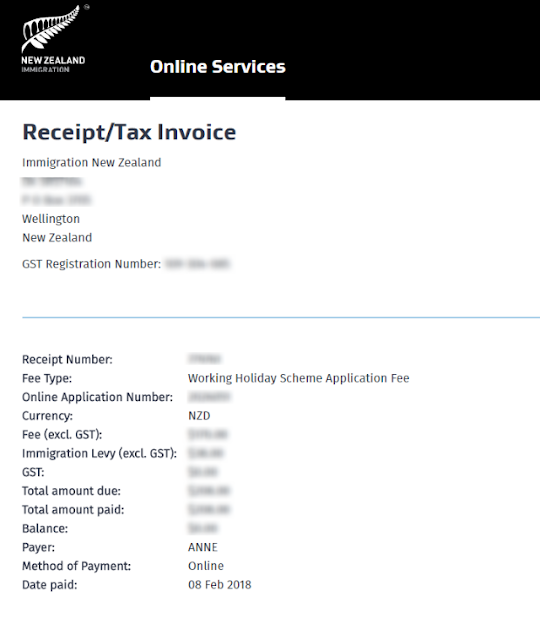 The form can only be accessed on the appointed application date by Immigration New Zealand so it’s essential that you take note of the date and the time. As I have mentioned above, getting a slot for this visa is highly competitive—it’s a game of speed and strategy, comparable to experiencing a Cebu Pacific Piso Seat Sale! Based on previous years’ trend, all 100 slots are taken within less than 10 minutes. Can you imagine that?! A lot of Filipinos will access and flood the INZ website on the application day and it’s normal for the site and its pages to crash, lag, and even not load at all! I tell you, you will be frustrated at how the site will be difficult to access on the application day and time. If the site loads successfully and easily, lucky you, so be real quick and laser-focus in filling out the form! 2. On your profile’s homepage, you will see three types of visa that you can apply for. 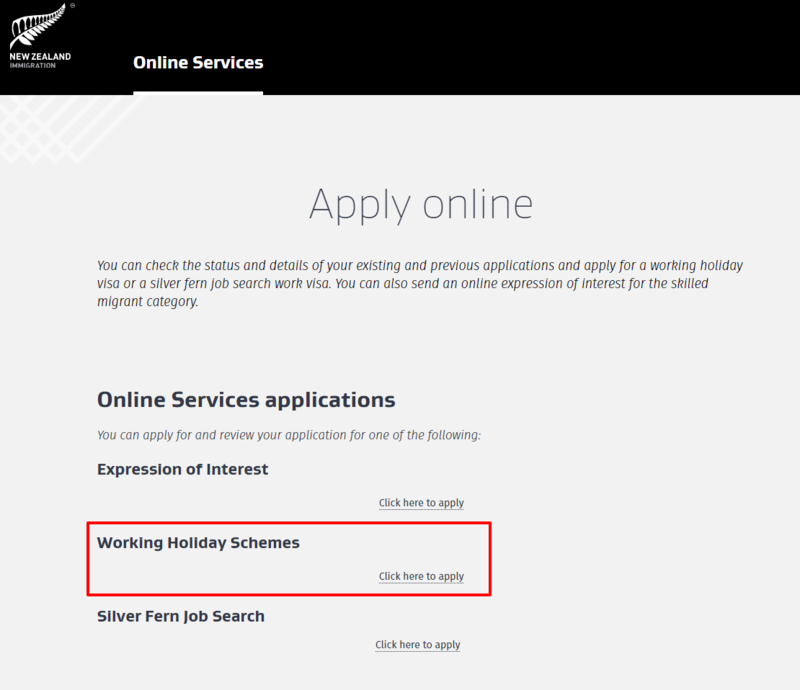 Select 'Click Here to Apply' under the 'Working Holiday Visa Schemes' option. 3. 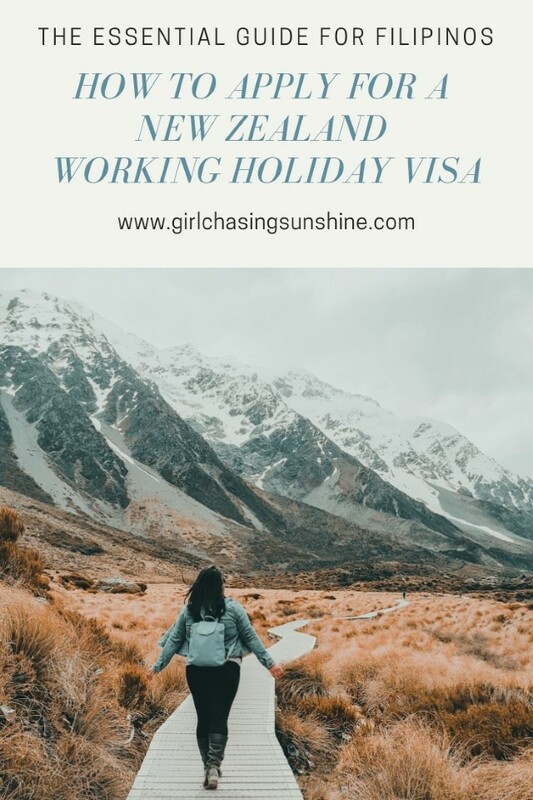 You will see a list of eligible countries / nationalities that can apply for the New Zealand Working Holiday Visa Scheme. This page will show which schemes are open or closed. Select 'Philippines'. 4. If you are accessing this page before the appointed application date and time, you will see this prompt. A few minutes before 5:00 AM Philippines time on February 07, 2019, start refreshing this page until you see the 'Apply Now' button. Click this option once available. 5. If you are lucky enough and if your internet connection is strong and stable enough, the online form should load next. You only need to answer the required fields, which are indicated with a red exclamation point inside the text box. Skip the rest as it will slow you down. As you complete each section, you will come across a decision: whether to click 'NEXT' or 'SAVE'? Whatever works for you at the time, choose that. What worked for me was clicking 'NEXT' however, I also read reports from previous years that clicking the 'NEXT' button led the page to crash so they had to re-do it all over again. What they did is to click 'SAVE' first before hitting 'NEXT'. Ultimately, whichever option leads you to the succeeding page without any hitch, choose that! 6. There are six sections / steps that you need to complete. 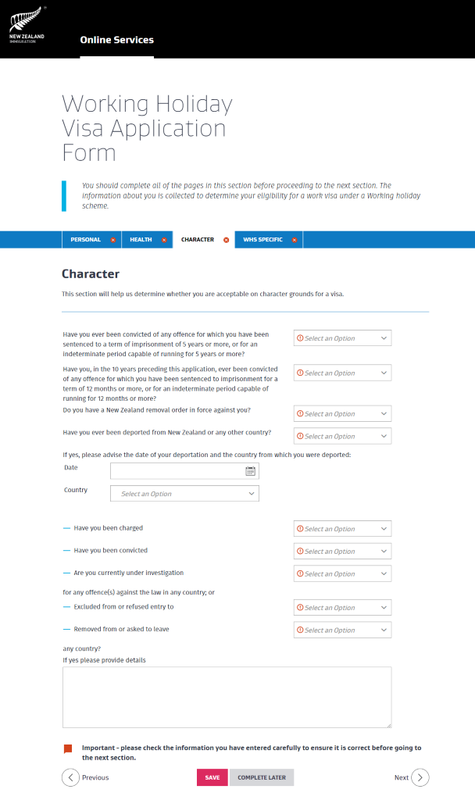 PERSONAL– In this section, you first need to provide your personal details such as name, date of birth, current address, and contact details. Hit 'SAVE' or 'NEXT' to go to the next tab, 'Identification'. 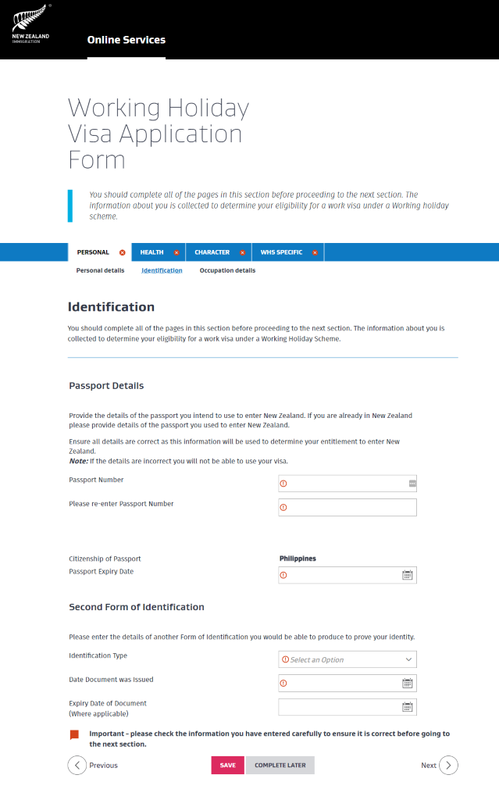 To complete the 'Identification' sub-section, you will need your valid passport and another form of identification. Don’t overthink the second ID as you will not be required to submit this. You may use details from your driver’s license, birth certificate, SSS ID, or TIN ID. Click on 'SAVE' or 'NEXT' once you have filled in all the necessary fields. You will now be directed to the 'Occupation Details' sub-section. Skip this as this is not required. If you answered that you are currently in New Zealand, a fourth PERSONAL sub-section will appear: 'Visa Details'. Answer this based on your circumstance. 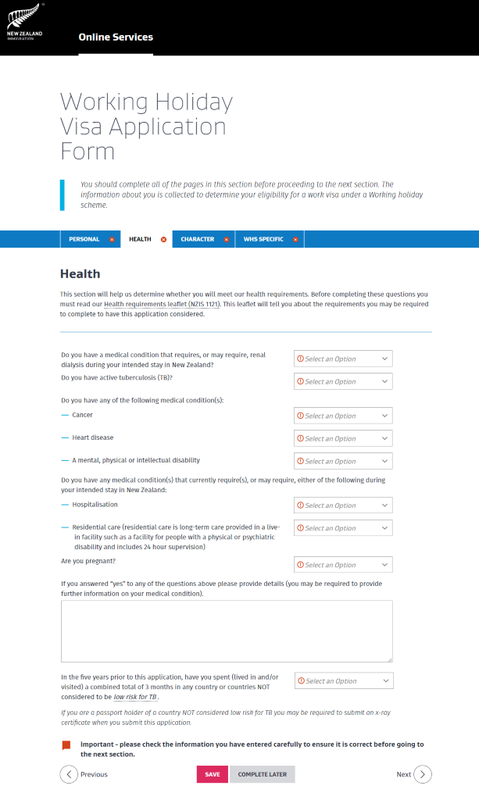 HEALTH– Respond 'YES' or 'NO' to the health questions listed. This will determine if you meet New Zealand’s health requirements. If you answer 'YES' to any question, you will be required to provide an explanation in the text box provided. New Zealand is strict regarding tuberculosis (TB) and since the Philippines is NOT a low-risk country for TB, you will most likely be required to undergo a chest x-ray examination. Once you are done with all the required fields, hit 'SAVE' or 'NEXT' to move on to the next section. CHARACTER– Your answers to this section will determine whether you are acceptable on character grounds. Similar to the 'Health' section, you must answer 'YES' or 'NO' to all the questions listed. If you respond 'YES' to any question, give an explanation in the text box provided. Once done, click 'SAVE' or 'NEXT' to go to the final section. 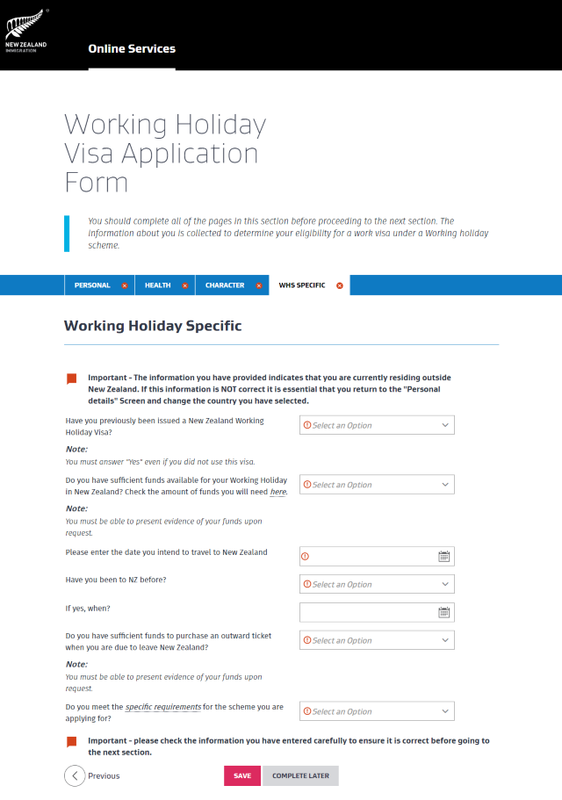 WORKING HOLIDAY SPECIFIC– These are questions to further prove if you meet the eligibility requirements for the visa. Please take note that whatever date you put on the “intended travel date” is not set on stone; you may or may not travel on these dates. You will see the 'SUBMIT' button at the bottom or the 'PROCEED TO SUBMIT YOUR APPLICATION' option at the top once you have completed all the required fields in this section. You may click on either option to go to the Confirmation / Declarations page. CONFIRMATION / LEGAL DECLARATIONS– Before you can actually submit your application, you will need to answer 'YES' to each statement on this page. Once finished, click on 'SUBMIT' to pay the levy fee. Note: A lot of websites and blogs have already published this form in previous years so feel free to cross-check amongst different versions. 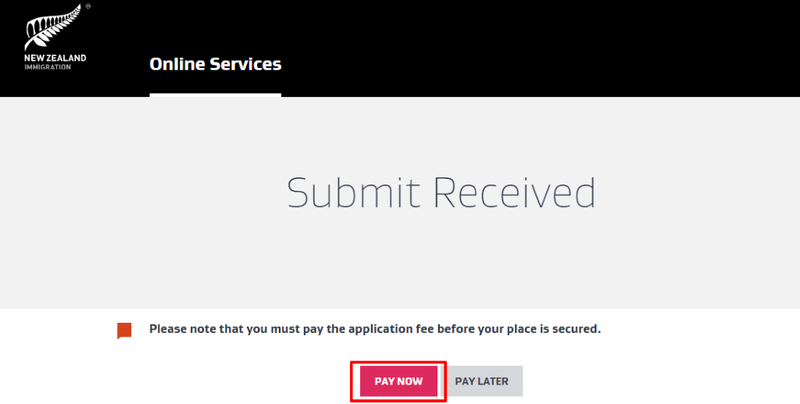 PAYMENT– Click on 'PAY NOW' to display your application fee. Again, the cost is NZD245. Make sure that your credit or debit card has enough balance to cover this. Only Visa or MasterCard credit or debit cards are accepted by INZ’s online portal. Click on “PROCEED TO SECURE PAYMENT SITE” to begin the payment process. Enter the payer name and click 'OK' to proceed to the payment portal. Enter your credit card details to complete the payment. If you have set your credit card to have a one-time password for an online purchase, you will receive an SMS for that. You can use another person's card but make sure that you are authorized to do so. 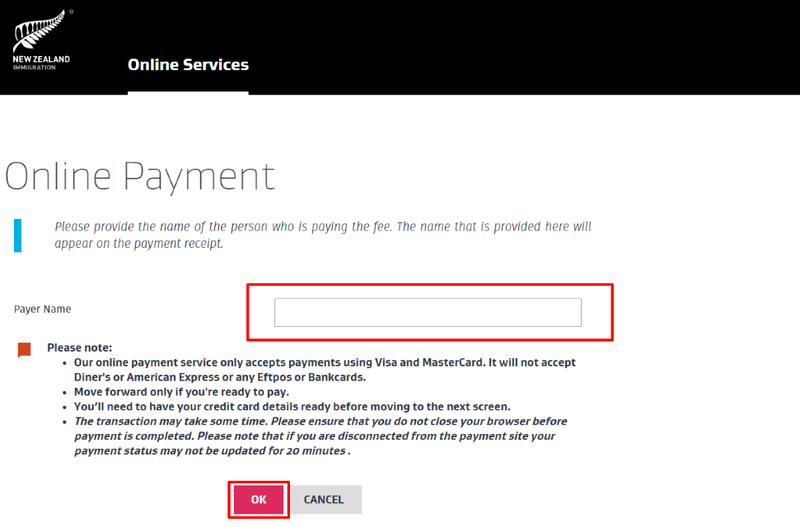 If the payment is successful, you will be shown a confirmation page saying that your payment has been successfully processed. You have the option to get a copy of and print the receipt. If you select 'OK', below is the confirmation page where you will be directed. Congratulations, you are one of the lucky 100 Filipinos who got a slot for the New Zealand Working Holiday Visa Scheme! Check your spam folder for these emails. Based on experience, the fourth email that you will receive is from your Case Officer (CO), stating that he/she will handle your application, where you should actually submit the required documents, and by when. Applicants are usually given 15 calendar days (including weekends) to provide the requirements. INZ Bangkok handled the application for our batch (2018), so the case officers assigned to us had to explain that we needed to disregard the first emails that we received informing us to submit it to INZ Manila through VFS Global. It seems that the initial automated emails that INZ are sending are outdated (at least until last year) so it’s best to wait for the email from your assigned CO. The documents required for submission will prove that you meet the visa’s eligibility requirements. In order for your New Zealand Working Holiday Visa to be processed, you need to provide the following minimum requirements. If you prefer to cover all bases, you have the option to also provide secondary or supporting documents. Submit at least two of the above, clean credit card statements, payslip, evidence of financial investments, etc. Note: A common inquiry is how long should the required funds have been kept in your account at the time of the application. You don’t want to raise any flag regarding the source of your funds so it’s a good measure that you have maintained the amount in your account for at least 3 – 6 months. That is what I recommend but note that it’s not explicitly required by INZ. I know some people who only had the funds transferred to their account on the week of their application and their visa was granted anyway so it’s really up to you to decide. Another note: Bank certificate versus bank statement. Some applicants opt to only provide a bank certificate because it only shows the current balance of your account (meaning it will not show how long the funds have been in your account) while a bank statement will show the movement of your funds. You can go ahead and submit just a bank certificate but you must also be ready to provide additional supporting documents, such as a bank statement, if and when your CO asks you to. E-medical Information Sheet. The requirement for Filipinos is actually a chest x-ray certificate but since we already have the e-medical system in the country, you can just go to any of the five accredited clinics / hospitals to have your chest x-ray and they will submit the results directly to Immigration New Zealand. The process is fairly straightforward: pick a clinic of your choice among the accredited institutions, go there, fill out the e-medical information sheet and provide a copy of your passport, pay the fee, and do the test. You will receive an automated email from your clinic once they have submitted the results to INZ. They will also reach out to you if there are any issues with your medical test and you have to retake it. Any one of these: Certificate of English as a medium of instruction from the university where you graduated OR an acceptable English test result (such as IELTS with an overall band score of 4.5 or more). Refer to INZ's Operations Manual to see other acceptable language test results. Cover Letter- if you need to explain a certain predicament relating to your application, do so in this letter. Letter of Authorisation- To authorise INZ to verify your submitted documents, especially with your university or bank. You don't need to have any documents notarized or certified as a true copy UNLESS otherwise instructed by your case officer. I did not have any documents notarized or certified as a true copy during our time. When in doubt, or if something is not clear to you, refer to your CO’s instructions or ask them directly. Once you have gathered all the required documents, the next natural step forward is to lodge your application and submit the documents. 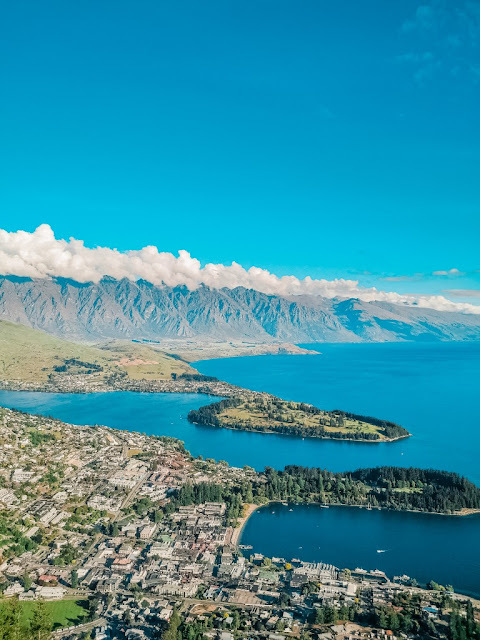 In previous years, if you are applying from New Zealand, you need to send your documents to Immigration New Zealand through a visa application centre. In the Philippines, that is through VFS Global in their Manila or Cebu branch. Note that you will need to pay a handling fee. I’m actually not familiar with this process because this was not how I lodged my application. For our batch (2018), INZ Bangkok handled our application and we were asked by our assigned case officers to send the documents to them through email. Personally, I find this option easier, cheaper (we didn’t have to pay for a handling fee! ), more convenient, and hassle-free. It seems that the submission process is changing and the only way to be 100% sure on where to submit your application is to wait for your CO’s email. That email will surely contain instructions on where you should send your documents. 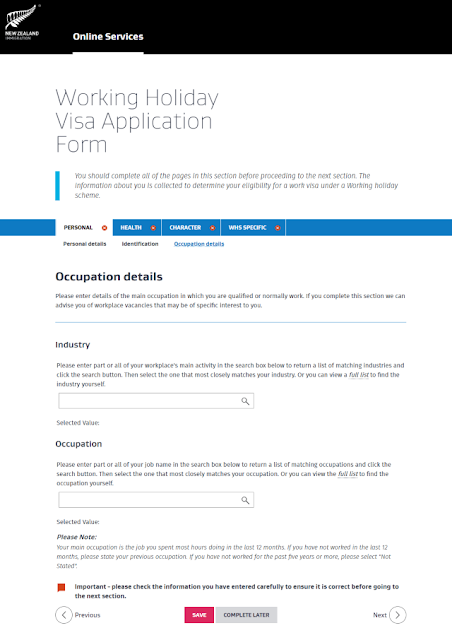 The INZ website currently states that processing time for a working holiday visa takes 20 business days. But I can speak for our batch (2018) which was processed by INZ Bangkok—most of us were given approval in less than three working days. There were even some who got their working holiday visa granted within the same day or after a few hours which was really impressive. As they say, “waiting time for us is working time for God” so just sit still and pray that you get a positive result. You can also use this time to read and research more about New Zealand and have your game plan ready. If INZ approves your working holiday visa application, you will receive an automated email informing you of the result. This email will also have your e-visa (INZ does not provide a visa stamp) and a letter addressed to the Philippine immigration stating that you don’t need to have an Overseas Employment Certificate (OEC) with the New Zealand working holiday visa. Now that you have that most-awaited visa, it’s now time to heed the call of adventure and get ready for your yearlong trip to Middle Earth! There are still tons of preparations involved—such as setting up your bank account, transferring / carrying your funds, getting your IRD, finding somewhere to live, and looking for a job—and if you want me to cover those in my next posts, feel free to comment below. 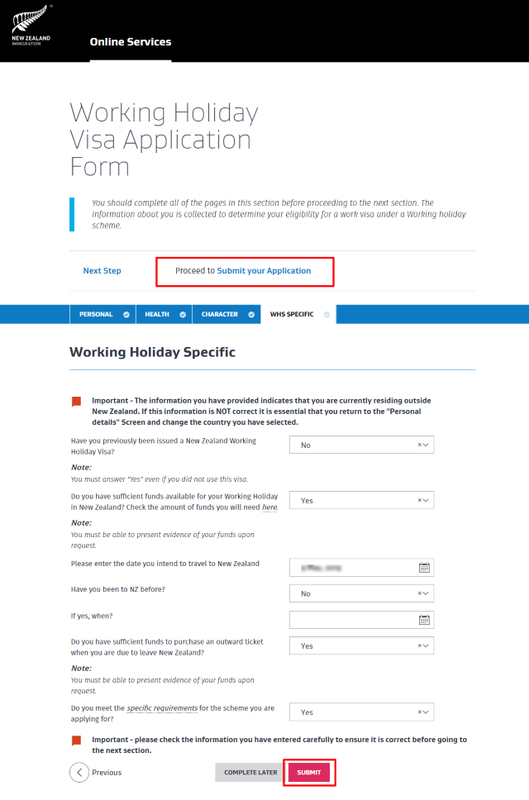 V. HOW DO I USE THE NZ WORKING HOLIDAY VISA? WHAT ARE THE CONDITIONS? You must come to New Zealand within 12 months of the date your visa is granted. 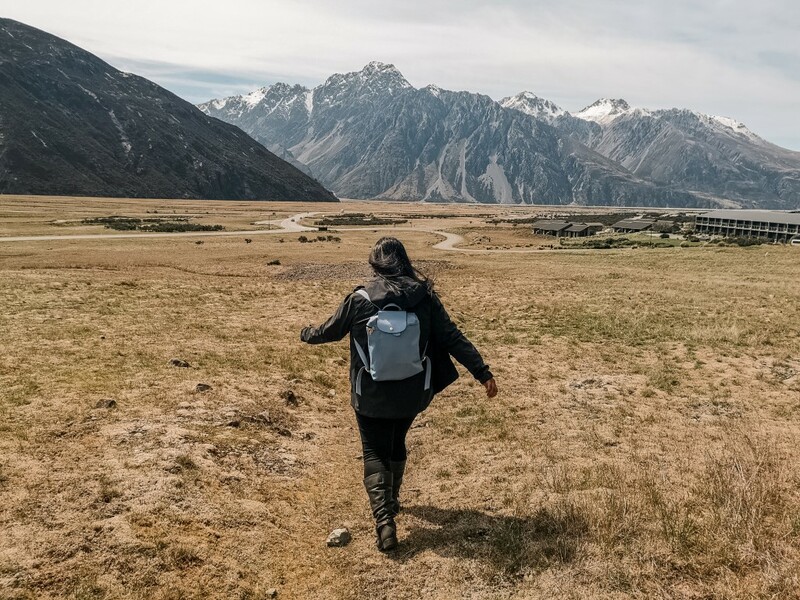 The working holiday visa allows you multiple entry to New Zealand so after you arrive, you can come and go from New Zealand as many time as you like before your visa expires. The date you enter New Zealand is the date when the one-year validity of the visa starts. 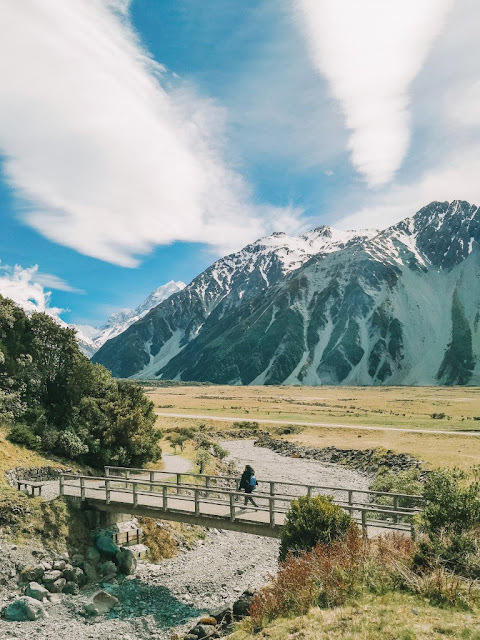 You must have a travel ticket out of New Zealand or enough money to pay for a travel ticket out of New Zealand, in addition to your living costs. You can work in any employment you like, as long as: (a) you don’t work for more than 3 months for any one employer; (b) you don’t work for more than 12 months in total; (c) you don’t get a permanent job; (d) the work you do is legal; (e) you don’t provide commercial sexual services; and (f) you don’t run or invest in a business that provides commercial sexual services. When you arrive, Immigration New Zealand may ask to see evidence of Items 3, 4, and 5. While these cases are rare, if not unheard of, this is explicitly stated in the INZ website so better be safe and have proof than be sorry! VI. WHAT TIPS CAN YOU SHARE IN GETTING A VISA? The short version is simple: PRAY & PREPARE. That’s really just it—those two P’s will help you get through the visa application. But I have a longer version which I hope will be helpful for you. As with any major life decision, you need to 100% all-in and committed. 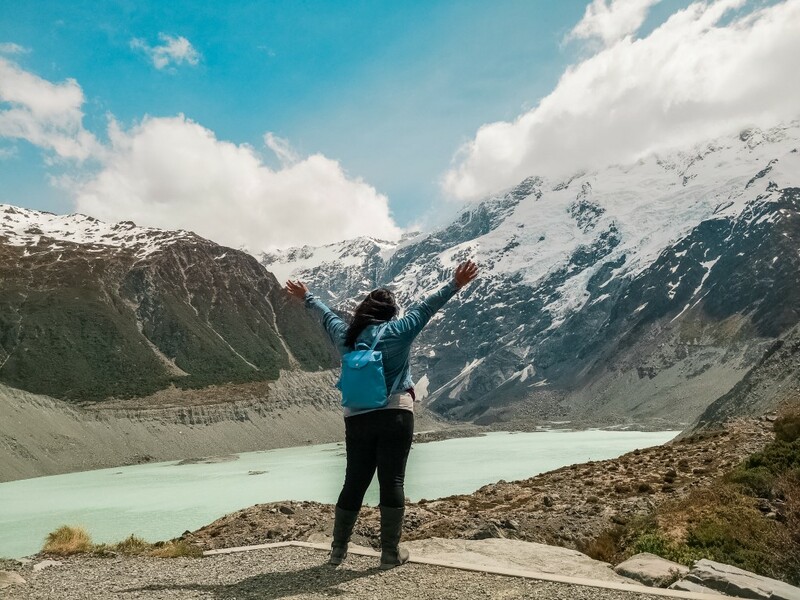 Have a conversation with yourself to know and understand your WHY—why do you want to go to New Zealand on a working holiday visa? What’s your purpose and ultimate goal? What do you hope to accomplish? Uprooting yourself from your home country to start a new life elsewhere is never without pains—you will be faced with serial disappointments and seemingly insurmountable challenges (in my lingo, nakaka-shookt nang malala!). And when those humps and bumps come, your WHY will be your anchor and your inspiration to keep pushing forward. I cannot stress enough how important it is to ensure that doing this is something that you really, truly, certainly desire. Being prepared entails having a sound knowledge of what you are getting yourself into. Don’t walk into something as big as this unprepared for what you will face. 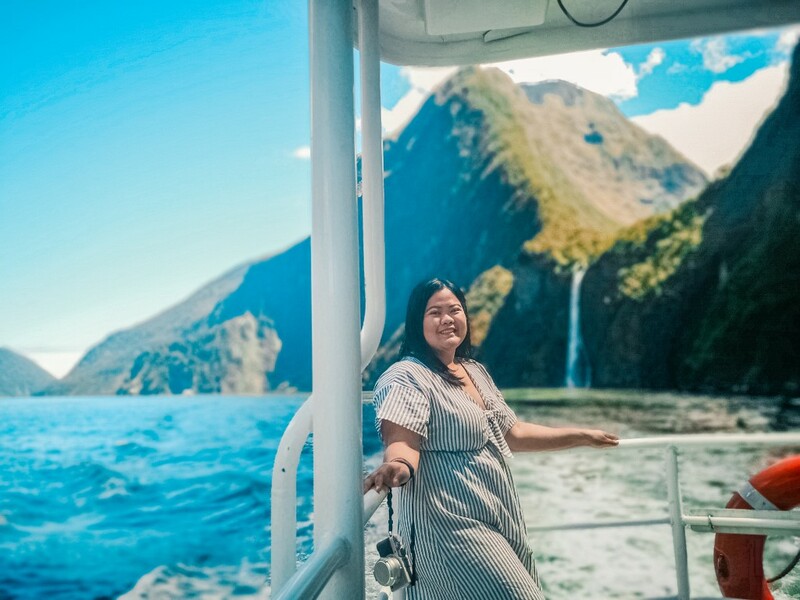 You should invest time, effort, and common sense in reading and researching as much as you can about the New Zealand Working Holiday Visa Scheme for Filipinos and life as an immigrant in New Zealand as well. Half of the battle is won by having an extremely reliable internet connection. You wouldn’t be able to load the form or even access the page if your connection is wonky. Personally, I checked in at a hotel in the metro to ensure that my internet connection will not give me frustrations during application day. I also know some who flew to other countries known for their fast internet. I’m not telling you to do the same; do whatever works for you. If you are confident about your internet connection at home or at your office, then use it. I’ve shared with you what the online application form looks like. Have all your information ready in a separate document, notepad, or Excel sheet. Again, do whatever works for you whether it be copy-pasting the info or typing ultrafast. I had my information in a notepad but at the heat of the moment, I found that typing briskly is what worked for me as I didn’t have to manage two windows / applications. In short, do not lie nor misrepresent yourself. Don’t ever think that you won’t be found out—it’s Immigration New Zealand; they have their ways. If you deliberately lie on the form and you are found out, it will be taken against you. There’s a risk that your visa application won’t be approved and your subsequent applications might be affected as well. Same goes with all the documents that you will submit—don’t even try and think of submitting fake documents! As you research more about applying for the New Zealand Working Holiday Visa Scheme for Filipinos, you will encounter seemingly “safe” tips and tricks that will aid you to get a slot, such as using automated tools (auto-fill and scripts) or practicing on another country’s working holiday visa scheme. Take these tips / advice with extra care. 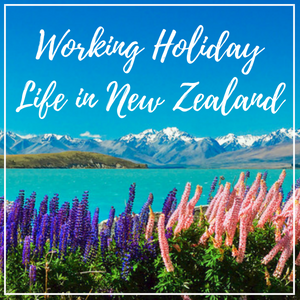 Before doing so, it’s best to read first Immigration New Zealand’s terms and conditions of use for the working holiday visa. The site states that any unauthorized access of the Working Holiday Scheme Online Service is not permitted. 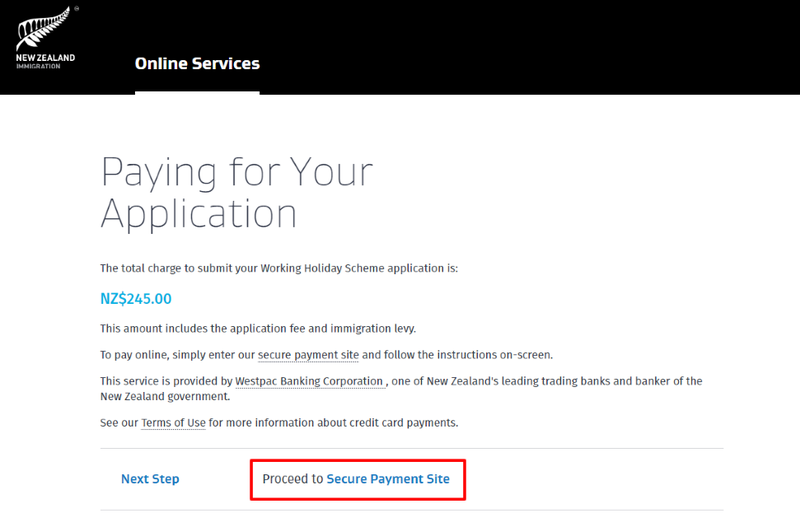 It’s always good to err on the side of caution because there are consequences (i.e., visa denied) if Immigration New Zealand finds out that you employed these forbidden tricks in accessing the form. Besides, isn't it a great feeling when you get the visa knowing that you played it fair and square? 7. Concentrate on and complete all required fields. Skip the rest. This tip is self-explanatory. Ensure that you give correct and complete answers to all required fields or else you will encounter an error and will need to go back to the same page. Don’t mind items that are not required—completing them will just slow you down. Do not be a #Negastar as you will attract the same vibes to your situation. Beshie, if you fail to get a slot, it’s not the end of the world. Always remember that. Do not fret. Have a fallback plan in place to get your act together quickly in case you are unsuccessful for this round or year. You can always re-apply again next year or try other visa schemes like the Silver Fern Job Search Visa. Trust and have faith that if this is God’s plan and will for you, He will surely successfully bring you to it. Whatever happens and wherever your decisions and actions take you, that is God’s best for you. This is by far my life's craziest and biggest decision and so far, I have no regrets! 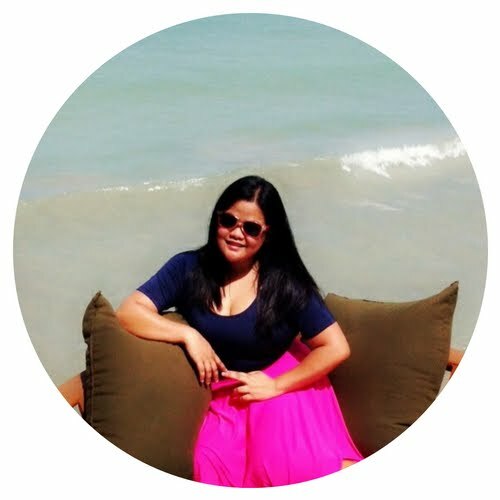 It's been one whirlwind adventure and I can only hope the same for you! If you are one of those who will try their luck for this year's round, all the best and may the odds be ever in your favor!!! That's it! These are everything I have to share about the application process for the New Zealand Working Holiday Visa Scheme for Filipinos! If you find this post helpful, hover over the image on the left to save and share it on Pinterest! hi need po bang may booked ng flight to nz before applying this visa? Hello, Arlene! Hindi naman. It's not one of the requirements. 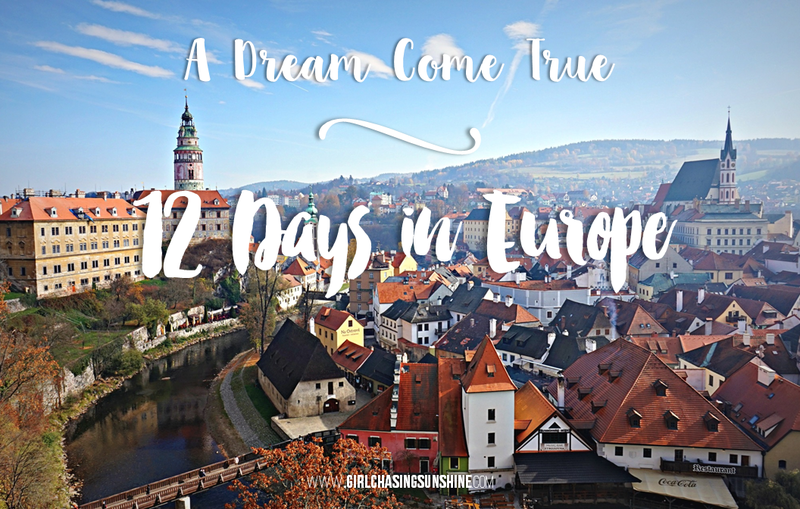 You can book your flight AFTER you get your visa approval. Hanggang 30 years old lang talaga? Hello, Treblig! Yes, hanggang 30 years old lang talaga. 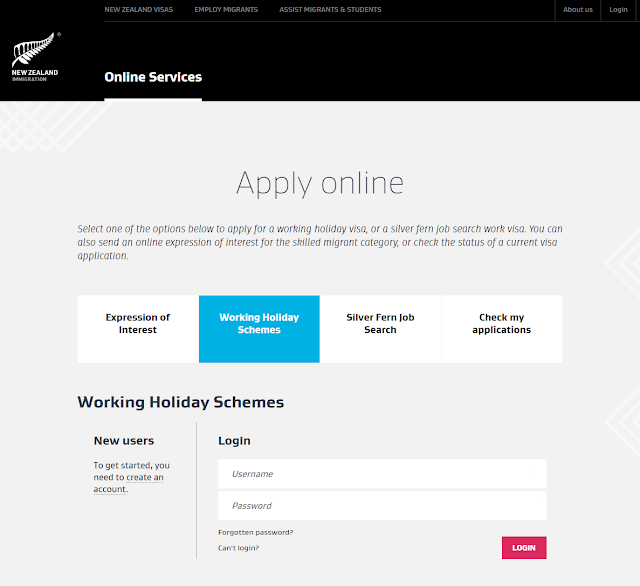 You might want to try the Silver Fern Job Search Visa (https://www.immigration.govt.nz/new-zealand-visas/apply-for-a-visa/about-visa/silver-fern-job-search-work-visa). For this one, applicants can be up to 35 years old. Very informative and very inspiring knowing that I am a fresh grad looking for a greener pasture. Can I ask po, do you have chances of permanently staying in NZ and become a citizen/resident when you use this visa as a stepping stone? Thank you! Hello! Thanks for reading. :) I've mentioned that in Part 2 of this blog post. To answer your question, yes it can be. You do have chances but it depends on a lot of factors, such as your employability, among others. How do u know the date na pwede mag apply every year? And once a year lang po ba nag oopen ang slot? Hello! Yes, it opens once a year. The date of application each year is announced on the Immigration New Zealand website. Hello, King! Puwede mag-apply kahit based overseas / nasa abroad ka as long as Philippine citizen ka. Hi! Thank you for this, I was able to secure a slot this year. However, I just received one automated email and the attachment is not opening (checked spam as well). Contacted them via email and still awaiting for a response. How long did your CO get in touch though? I'm just worried that I haven't received the other two automated emails. Can your Visa be used to go US if you get approve? I've read from the site that theres a lot of kind of Visa from this site and i dont know what kind should i apply.